A tapestry is a magnet for airborne dust, soil and smoke particles. If yours is a valuable or very old piece, have it professionally cleaned to avoid irreparable damage. 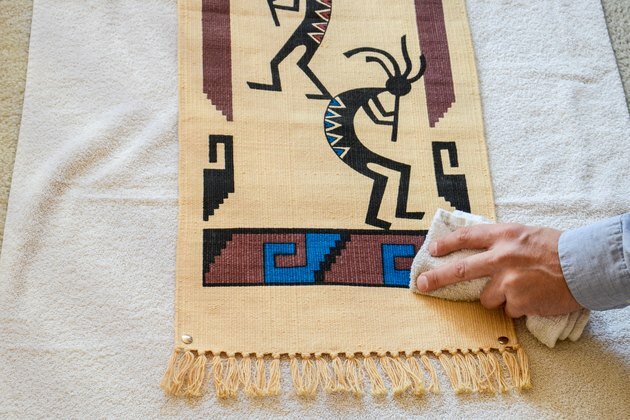 Tapestries that may be cleaned at home should still be treated with extreme caution -- no washing in washing machines. Most of the time, it's best to skip immersion in a water bath with gentle detergent because the stress can damage fibers and affect dye in numerous ways. Try a moderately cautious dry- or sponge-cleaning for best results. 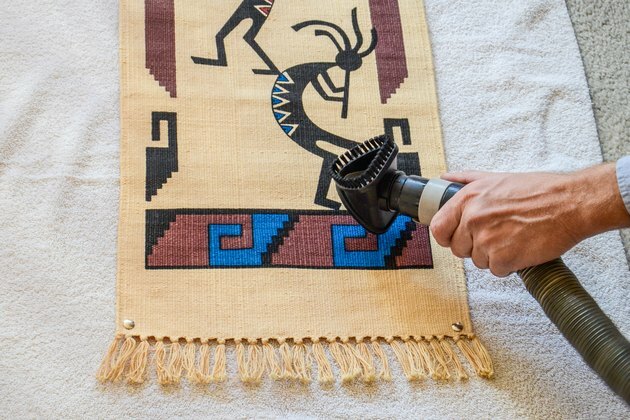 Vacuum your tapestry to remove the loose dirt and soil that can degrade fibers or soak into them if the piece gets wet. Place a piece of synthetic -- not metal -- screen over the tapestry and use an upholstery attachment to vacuum it. Don't try this with a beaded or an old embroidered or stitched piece; loose threads or beads could be dislodged by the suction. Test a dry solvent or a mild detergent on an unobtrusive corner of the tapestry by delicately applying the cleaner with a white cloth. Wait a few minutes to determine if the cleaner is blurring or fading the dye. Press a dry white cloth to the spot to absorb as much cleaner as possible. Check the white cloths for color to determine colorfastness. 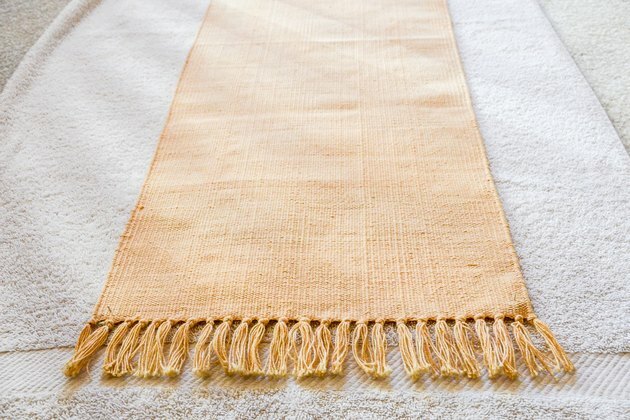 Lay the tapestry flat on a clean white towel and work on one section at a time, applying the cleaning solution -- recommended soap or dry cleaning solution -- with a clean cloth and extracting the moisture with a dry cloth. Don't soak the fibers as they may swell and distend the pattern. Vacuum the tapestry again to lift away any soil that has been loosened by the cleaning. 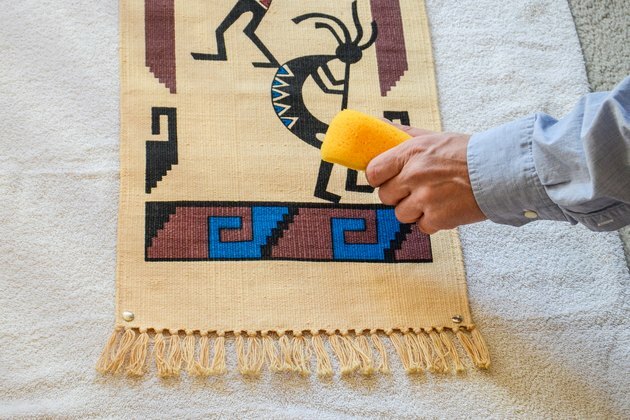 "Rinse" the cleaner out of the fibers with distilled water, using a clean sponge that has been wrung nearly dry to press lightly against the surface of the tapestry. Press again with another clean cloth or lint-free towel to soak up all possible moisture from the fibers. 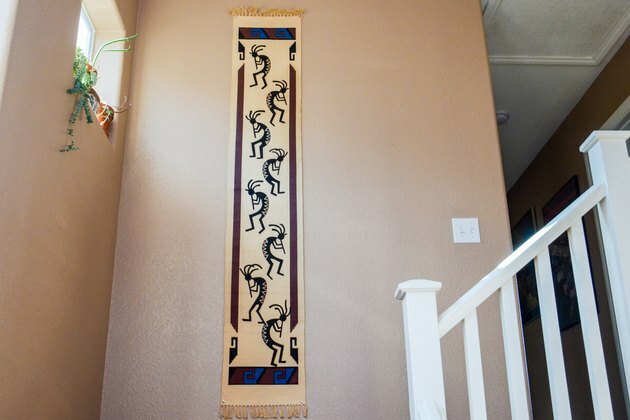 Allow the tapestry to dry completely before re-hanging it. Keep it lying flat on dry, clean, white towels, and turn it over so the air reaches both sides. This prevents mold from forming on the back where the fibers touch the wall, and it avoids placing stress on wet or damp fibers that could stretch under the weight. Can I Wash a 70-Percent-Silk, 30-Percent-Cotton Fabric That Says to Dry Clean It? How Do I Clean My Silk Kimono?